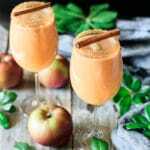 Caramel apple mocktail is a showstopping nonalcoholic drink recipe for kids and adults to enjoy. It’s a sweet treat made with homemade caramel sauce, cold apple cider, and sparkling ginger beer. The decorated rim of caramel and sugar with the cinnamon stick garnish makes this autumn party drink perfect for the Thanksgiving holidays. Dip the rim of the glass in the caramel sauce, then dip it in the demerara sugar. Pour the warm caramel sauce into the glass, then the apple cider and finish with the ginger beer. Stir until well combined. Garnish with a cinnamon stick. Serve immediately. Warm caramel sauce will dissolve quicker than cold caramel sauce. The ratios are 2:2:1 for the apple cider, ginger beer, and caramel sauce. Cutting the caramel sauce in half will lower the calories by 200.